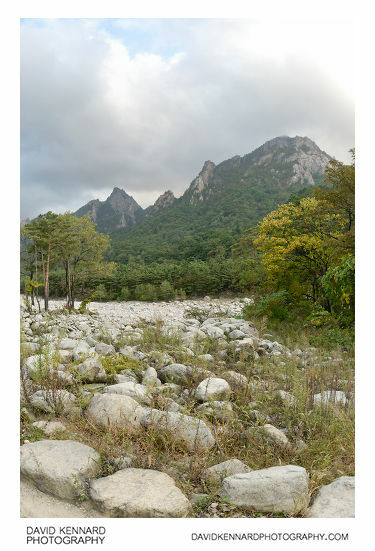 This post is part of a series on my visit to Seoraksan National Park on the fifth day of my Holiday in Seoul, Korea. 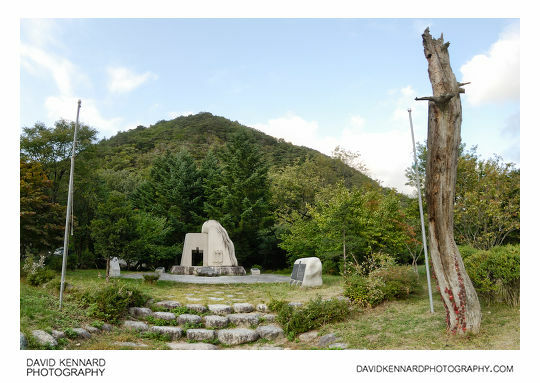 If you haven't read the first part, that's here: Korea day 5 part 1 - Route 7 through Sonyang-myeon. 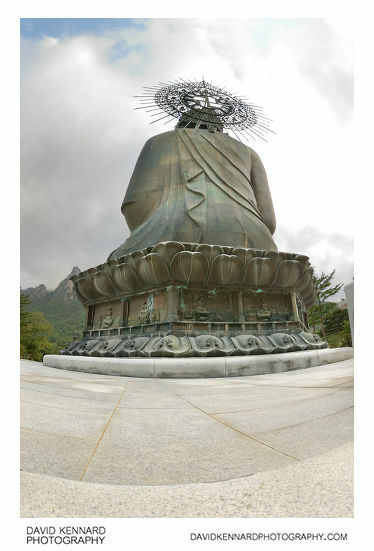 Above is a view of the back of the Unification Buddha (Hangeul: 통일대불; Hanja: 統一大不). There is a temple below the Buddha, which is accessed from round the back, near where this photo was taken. Unfortunately you weren't allowed to take photos in the temple (most Buddhist temples don't allow photos). It was filled with hundreds, maybe thousands of small gold statues. (Gold as in gold colour, I doubt they were actually solid gold). And above is a front-side view of the statue. I used Topaz Adjust on this one, which did a good job of bringing out the colour in the clouds. 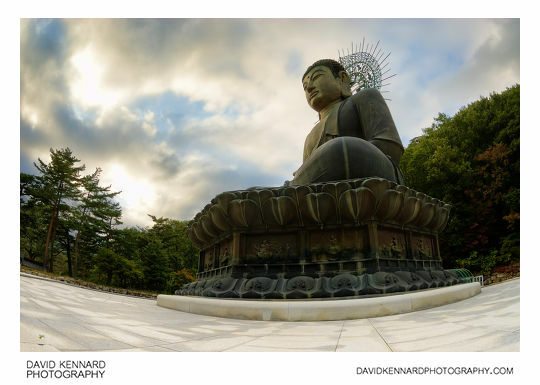 The Great Unification Buddha is the largest seated bronze Buddha statue in the world. It was built to symbolise the Korean people's hope for the reunification of North and South Korea. The statue cost ₩3.8 billion (US$4.1 million) to erect, which was raised over a decade, with the construction being completed in 1997. The Buddha statue sits on a lotus pedestal, which is flanked with 16 inscribed panels that tell of the entire path of Buddha's enlightenment through the words of the Bodhisattva, messengers of Buddha's teaching. Including the pedestal, the total statue height is 18.9m, and has a total weight of 108 tons. After looking round the temple underneath the statue, we went off on a walk. However, we noticed that everyone was walking the opposite way to us. In the guide book we had (Lonely Planet), it said that the park closed 2 hours before sunset, so we decided it might be best to do the same as everyone else and walk back towards the entrance. We didn't want to be locked in the park overnight. On the way back we stopped by this War Memorial, which is dedicated to the young people who fought in the Korean war, but weren't officially enrolled in the army. 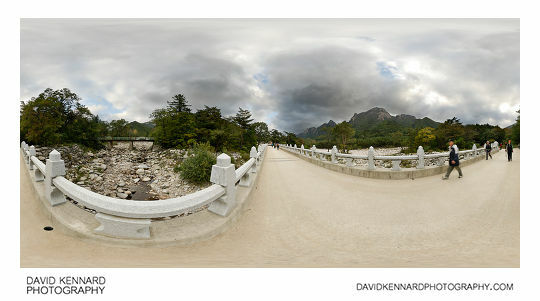 Back near the main visitor area of Seoraksan, I went down to the dry riverbed and took the above photo at the edge. 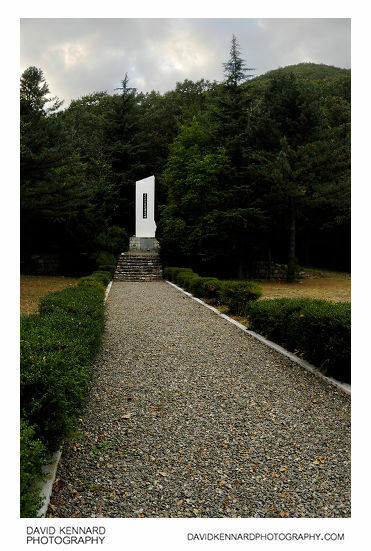 There are a number of monuments scattered around the main visitor area of Seoraksan. Unfortunately I couldn't find any information on what the above monument was built for. 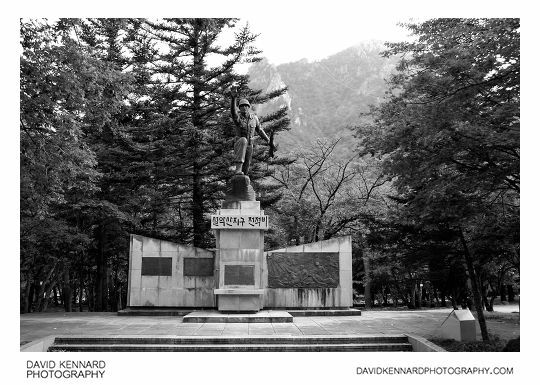 The above is another Korean War memorial. Apparently the area of Seoraksan saw some quite heavy fighting during the war. 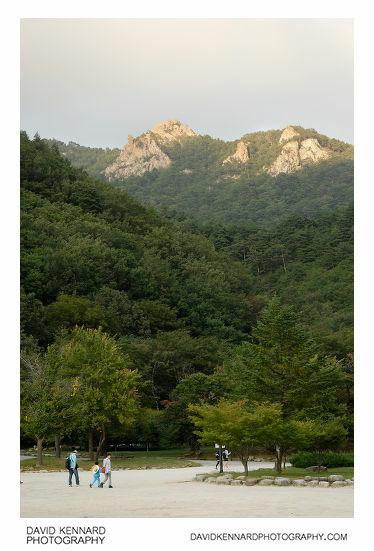 In this photo you can see some people walking towards the park exit, and the low sun just hitting the peaks of the mountain beyond. I think that actually it was less than 2 hours until sunset by the time we left the park, and we didn't see any large gates they could close. So I don't think the park does close at 2 hours before sunset. Maybe they just stop selling entrance tickets 2 hours before sunset. You didnt take pictures of the temple below the buddha? I still remember wks before the trip, I dreamt of the Golden Statue of a thousand hands Goddess of Mercy and the surrounding (inside of the temple). So when I reached the place, i was stunned by what i see. The walls paintings, the Golden Statue of the Goddess of Mercy is right in front of me, as what I have dreamt. Needless to say, I am down on my knees praying. There wasn’t anyone i can communicate with in English. Yr post just confirmed that the temple is below the Buddha. I cannot find it elsewhere. Thank you.